For this month’s Ugly Object blog post we felt that we should pay homage to a small but significant variety of artifact: the pottery sherd. There are millions of these things out there, in the field, patiently awaiting discovery. So why the reverence? Because while pottery sherds may be irregular in shape and incomplete in form, these little dudes are often jam-packed with information. We recognize that we’re preaching to the choir, archaeological ceramicists out there, but for those who were unaware of the vast informational value of sherds, consider this month’s Ugly Object. KM 1980.2.39, exterior and interior views. Chris Ratté: This is ugly?! Why don’t you understand that this is a beautiful sherd? Conservators: Well, this is not exactly fine art. But a lot of our “Ugly Objects” possess qualities that might be otherwise overlooked, such as charm or informational value. Anyway, what can you tell us about this sherd? Chris Ratté: The sherd comes from a mold-made Megarian bowl. The guilloche and egg-and-dart relief patterns are similar to moldings I know from architecture, such as at the temple of Apollo at Didyma. Conservators: Cool! Can you tell us how the bowl was fabricated? Chris Ratté: The bowl was thrown into a mold on a wheel. The relief pattern in the mold was cast from a silver vessel. The bowl itself was made in imitation of a particular type of metal vessel connected to the Egyptian king Ptolemy’s visit to Athens. * The ceramic bowls that were made from this were very popular, but were not produced for very long. Conservators: Wow! Who knew? How was the bowl used? Chris Ratté: For drinking. The bowl wouldn’t have had handles, and I like to imagine what it might have felt like to hold the vessel in my hands and feel the relief beneath my fingers. Urban Biographies guest curator Christopher Ratté. Want to learn more about this and other diagnostic sherds? Be sure to visit the Kelsey starting August 24th to see the upcoming exhibition Urban Biographies, which will demonstrate ways in which artifacts and modern technologies are used to study ancient (and modern) cities. *Ptolemy V Epiphanes and his son Ptolemy VI Philometer visited Athens in 182 BCE for the Panathenaic Games. When it comes to the Kelsey Museum of Archaeology’s collections, not all artifacts are created equal. Some call out to us intellectually, others emotionally. With this in mind, we asked our curators to name their favorite Kelsey Museum artifacts and why each was a favorite. This is the first in a series of seven. About Artifact. 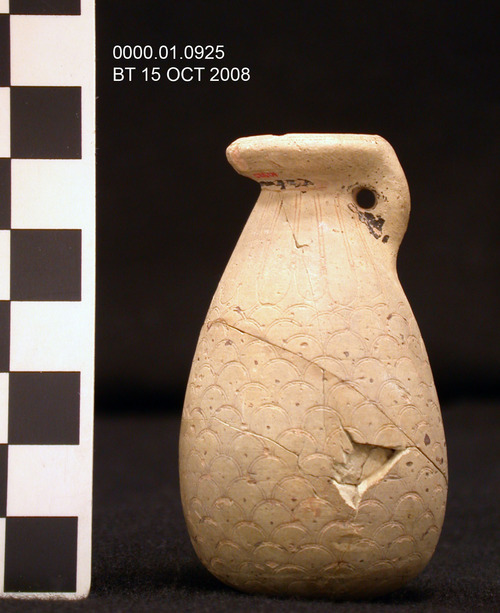 This small oil bottle originally was decorated with a colorful pattern of small red, yellow, and black scales. The ancient paint has disappeared and all that remains of the artist’s meticulous work are incision marks outlining the scales and the center impression of the compass point used to make them. Find It. In the ancient Greek case (on the left-hand side in front) on the first floor of the William E. Upjohn Exhibit Wing of the Kelsey Museum of Archaeology.